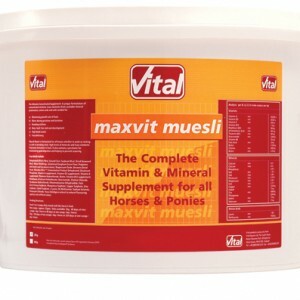 A unique formulation of concentrated vitamins, trace elements (from available mineral proteinates), amino acids and salts needed for: Maximising growth rate of foals, Mares during gestation and lactation, Breeding stallions, Bone, hoof, hair and coat development, High blood counts, Feed deficiency max-Vit Muesli is formulated for all horses whether in work or resting as well as breeding stock. 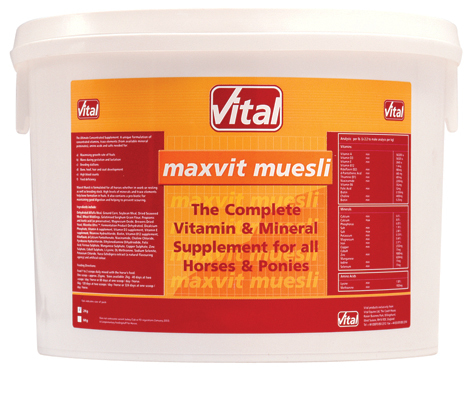 High levels of minerals and trace elements help bone formation in foals. 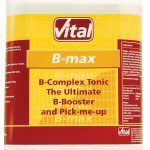 It also contains a pre-biotic for maintaining good digestion and helping to prevent scouring. 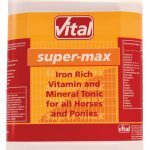 Dicalcium Phosphate, Wheat Middlings, alfalfa meal, Soya bean meal, dried seaweed, ferrous sulphate, liquid paraffin, zinc sulphate, L-Lysine, Manganese Sulphate, FOS, Salt, Copper Sulphate, Choline Chloride, Magnesium oxide, Potassium Chloride, Vitamin E, Preservative, Nicotinamide, Yucca Extract, DL-Methionine, Vitamin B12, Vitamin B2 (riboflavin), Biotin, Vitamin B1 (Thiamine Hydrochloride), Calcium d-Pantothenate, Cobalt Sulphate, Vitamin B6 (pyridoxine Hydrochloride) Sodium Selenite, Vitamin D3, Potassium Iodide, Folic Acid.